This is to acknowledge the receipt of your payment files in regards to your outstanding payment based on inheritance and contract files forwarded to my office from the presidency Federal Government of Nigeria for immediate remittance of Fifteen Million USD Only (USD15, 000,000.00) is already Approved in your favor. I wish to notify you that your payment had reflected in our systems and we want you to reconfirm all information�s to authenticate the validity for the payment of your funds via any of the payment modes below. The Federal Ministry of Finance submitted your file to my office here by order of Presidency and they were signed at the NATIONAL ASSEMBLY for the release of USD15, 000,000.00 and the processing of the payment has started. More so, Documents to back up these funds are being arranged at the Federal High Court of Nigeria and will be sent to you via Fed Ex. OPTION# 1: Global Acceptable ATM Electronic card. REQUIREMENTS: Your Full Name and Physical mailing Address, Telephone Number A copy of your Id card or International Passport for Photo Identity. The ATM card will be dispatched to your given address via a registered courier. OPTION# 2: PAYMENT BY INTERNATIONAL BANK-TO-BANK WIRES TRANSFER. Provide us your Bank Information�s..
OPTION# 3: PAYMENT BY CASH DELIVERY. REQUIREMENTS: Your Full Name and Address, Telephone Number A copy of your Id card or International Passport for Photo Identity. This form of payment Diplomats from the Central Bank will be assigned to deliver some boxes to you and the contents are your funds worth US$15,000,000.00 so if you agree on this kindly get back to me with the requested details. These Three modes of Payment are currently available under the Central Bank of Nigeria payment modes, so kindly get back to me with your preferred mode of payment. Having received this vital payment directive, you are qualified now to receive and confirm your payment with your bankers within the next few days. The target of this office is to ensure that all pre-qualified inherited / contract beneficiaries receive their payment within the next 5 banking days of the commencement of the pre-qualification exercise; I therefore seek for your full co-operation so as to ensure that the target is archived successfully as promised. This message, and any attachments to it, may contain information that is privileged, confidential, and exempt from disclosure under applicable law. If the reader of this message is not the intended recipient, you are notified that any use, dissemination, distribution, copying, or communication of this message is strictly prohibited. If you have received this message in error, please notify the sender immediately by return e-mail and delete the message and any attachments. Thank you. 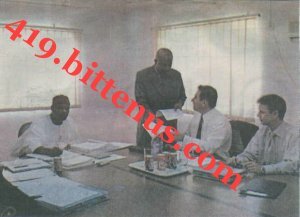 This is to acknowledge the receipt of your payment files in regards to your outstanding payment based on inheritance and contract files forwarded to my office from the presidency Federal Government of Nigeria for immediate remittance of Fifteen Million USD Only (USD15, 000,000.00) is already Approved in your favor. I wish to notify you that your payment had reflected in our systems and we want you to reconfirm all information’s to authenticate the validity for the payment of your funds via any of the payment modes below. The Federal Ministry of Finance submitted your file to my office here by order of Presidency and they were signed at the NATIONAL ASSEMBLY for the release of USD15, 000,000.00 and the processing of the payment has started. More so, Documents to back up these funds are being arranged at the Federal High Court of Nigeria and will be sent to you via Fed Ex. Provide us your Bank Information’s.. I RECEIVED YOUR MAIL, I MADE IT CLEAR FROM THE MAIL I SENT TO YOU THAT YOUR PAYMENT HAS BEEN RESCHEDULED BECAUSE OF THE TWO CANADIANS I RECEIVED IN MY OFFICE TOGETHER WITH YOUR LAWYER .SINCE YOU REQUIRED TO RECEIVE YOUR PAYMENT BY CHEQUE , I AM HOLDING A MEETING TODAY WITH THE DIRECTOR OF THE INSURANCE COMPAPANY BECAUSE YOU HAVE TO RECEIVE YOUR FULL PAYMENT WHICH IS US$17MILLION BY CHEQUE AND THERE MUST BE INSURANCE COVER COVERING THE CHAQUE. AFTER THE MEETING, I WILL HAVE ANOTHE MEETING WITH THE CURRIER COMPANY AGENT THAT WILL DELIVER THE CHEQUE TO YOU IN USA. AS SOON AS YOU RECEIVE THIS MAIL CONFIRME TO ME THE MAILLING ADSSRESS THAT I AM GOING TO USE TO DISPACTH THIS CHEQUE TO YOU IN USA. I CALLED YOUR NUMBER IT WAS ON AN ANSWERING MACHINE BUT I LEFT MY NUMBER FOR YOU TO CALL ME BACH AS SOON AS YOU RECEIVE THE MASSAGE. IT WAS AS A RESULT OF THE TWO CANADIANS WITH YOUR LAWYER THAT VISITED ME IN MY OFFICE AND INFORMED ME THAT YOU SENT THEM TO COME AND RECEIVE YOUR FUND WITH A POWER OF ATTORNEY ON YOUR BEHALF. I WAS SHOCKED WHEN I RECEIVED THEM , I DECIDED TO CONTACT THE MINISTER OF FINANCE WHOM CONFIRMED TO ME THAT YOU ARE THE ORIGINAL BENEFICIARY OF THIS FUND. PLEASE AS A MATTER OF URGENCY I NEED A CLARIFICATION FROM YOU AS SOON AS YOU RECEIVE THIS MAIL. AS YOU ARE SUPPOSE TO RECEIVE CASH PAYMENT OF US$10.5MILLION THROUGH THE DIPLOMATIC OFFICIALS THAT WILL ARRIVE IN USA TO DELIVER THIS CONSIGNMENT TO YOU. FOR YOUR CONFIRMATION I ATTACHE THE PICTURE OF THE TWO CANADIANS WITH YOUR LAWYER WHICH I TOOK WITH THEM IN MY OFFICE .THIS EXACTLY WHY I HAVE TO RESCHEDULE YOUR PAYMENT. I AWAIT YOUR CONFIRMATION IN THIS ISSUE.